They’re known as the “crazy head-shaving people” and they held their single, largest fundraising event Saturday evening in Bondurant. The California-based St. Baldrick’s Foundation holds the events across the country to raise money to help fight childhood cancer. The volunteer-powered charity funds more in childhood cancer research grants than any other organization except the U.S. government, according to the group’s website. 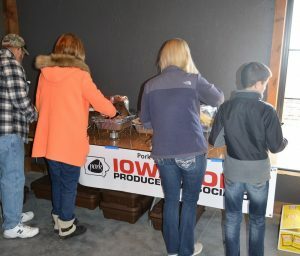 Several hundred people filled the newly opened Clover Barn at Irishmen Acres to enjoy food, including pulled pork donated by the Iowa Pork Producers Association, drink, a large silent auction and the thrill of watching donors have their heads shaved by professionals from Sports Clips. There’s nearly a dozen head-shaving events held around Iowa each year and an average of 70 kids and adults enthusiastically agree to have their locks shorn for the cause at the Bondurant event, according to Clayton. The event raises around $100,000 each year, Clayton said, with the money given to children’s hospitals in Iowa. “Every dollar matters and the more we raise, the closer we can come to finding a cure,” Clayton said. IPPA supported the event as a community service project and may look to expand its involvement next spring.